Wikipedia.org defines O.E.M. (Original Equipment Manufacturer) as, "a company that uses a component made by a second company in its own product, or sells the product of the second company under its own brand." Athearn was involved over the years in a number of agreements of this O.E.M. variety. In this section, I will outline and provide basic information and highlights on these various offerings and present them in chronological order. To my knowledge the first example of Athearn producing a group of HO-scale trains to be sold under another company name dates to 1958 and Lionel-HO. I high recommended picking up a copy of "Greenberg's Guide to Lionel HO Volume I 1957-1966," as it details this story very well and any major treatment I may attempt here would be redundant to that effort. In brief, Lionel had originally contracted with Rivarossi in Italy to supply a line of HO-scale trains for the introduction of Lionel-HO in the late '50s. Production issues caused Lionel to consider a second source and Athearn was tapped to make product. Beginning in 1958, Athearn produced items began appearing in the Lionel-HO line. Most notable are the Rectifier Electric and Auto Loader, both produced by Athearn at the reported request of Lionel. Other Athearn made Lionel pieces tended to mirror releases found in Athearn's own offerings, but inspection of examples will usually show you the circled "L" logo of Lionel present differentiating them from regular Athearn pieces. Lionel-HO would remain in the market until the mid 1960s, however the company began making its own product by 1960 and Athearn was no longer directly involved. 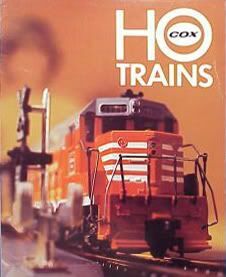 My research found a holiday season 1971 release for the first group of Athearn-made items under the Cox name. 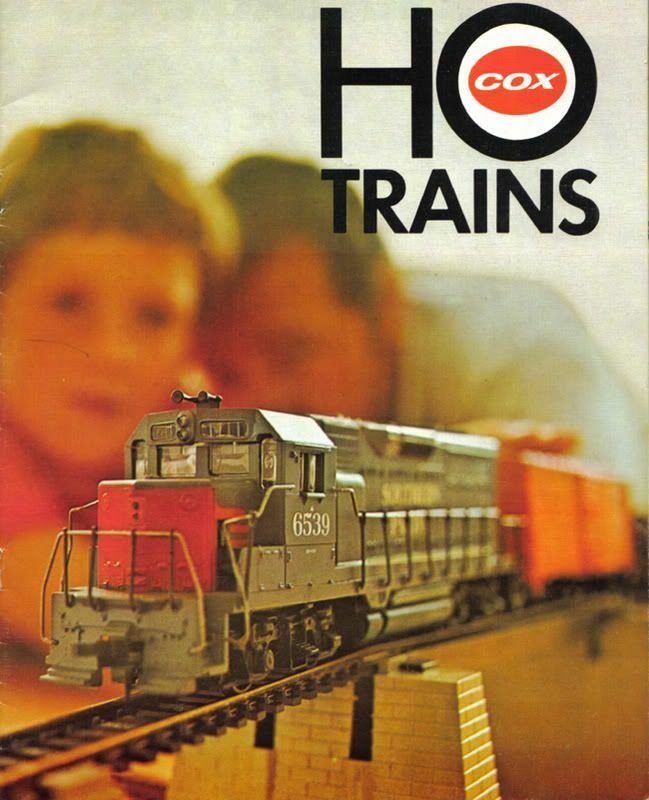 Cox sold Athearn products from 1971 until 1975 and the arrival of the company's Hong Kong-produced HO-scale trains. The Athearn items under the Cox name of the early '70s are interesting, as they represent the first time ready to run models of Athearn product were sold since the mid '60s. 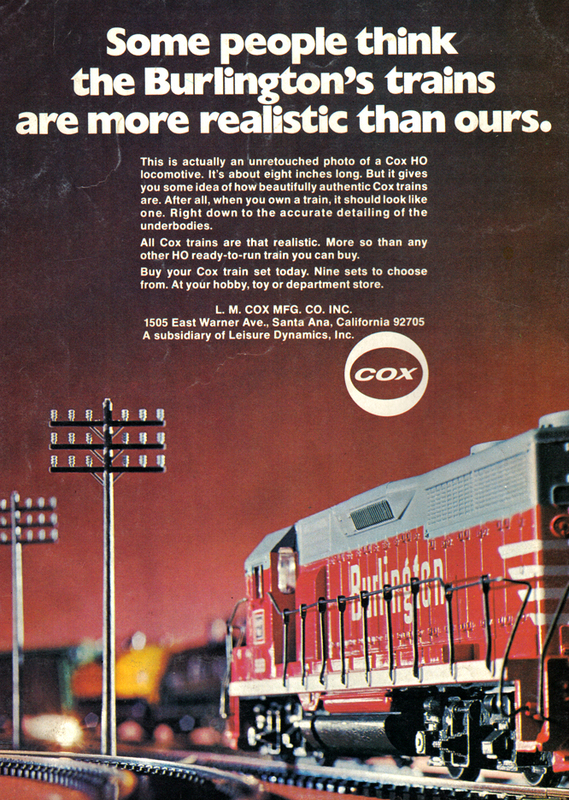 Generally, what you could buy as a Cox release was the same as what was found in the Athearn line. 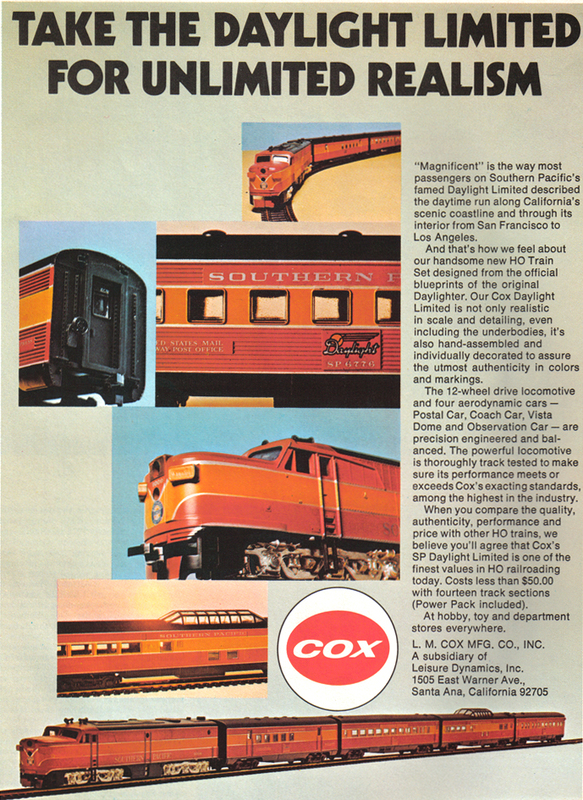 For example, the Cox GP35 in Southern Pacific carried the same paint and same roadnumber as its Athearn counterpart. There are exceptions and these make for interesting pieces to be noted. 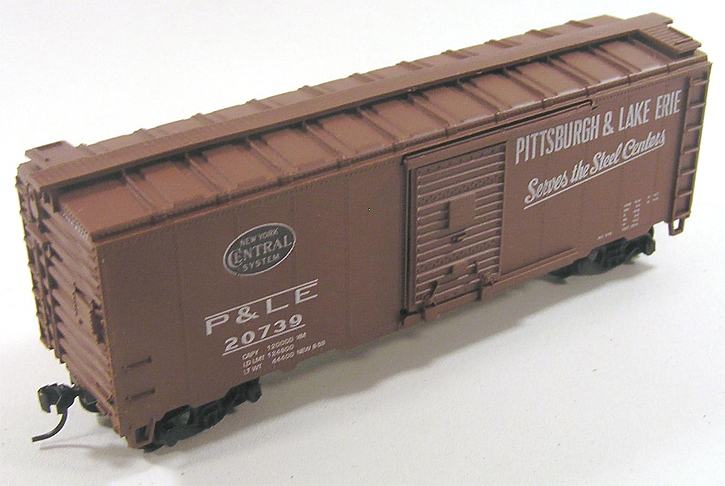 Athearn supplied Cox with a black Penn Central F7A that was not found in the Athearn line. A matching green Standard Cupola Caboose was also in the Cox line and no Athearn counterpart existed. I believe the two Hustler switchers offered under the Cox name, the Rio Grande and the Silver with red stripes model, are the first time this model came with a geared drive. Prior Athearn offerings of the Hustler were rubber band driven. The Operating Dual Crossing Gate in the Cox line was the one from the Athearn line, however this was to my memory a hard to find out of production piece in th early '70s and only available as the Cox release. Of the Athearn rolling stock sold by Cox, the most notable is the 50' Flat Car with Deck. This was Athearn's standard 50' Flat Car model, but a new tooling separate plastic deck was cast to ride on top of the bed of the flat car. The deck included Athearn trailer hitch found on the 85' flat cars and separate brake wheel. This was flat car was designed to carry the standard Athearn 40' trailer. When Cox production moved to Hong Kong in '75, a similar 50' Flat Car would remain in the line. The Hong Kong-made car however is a single piece mold and diffes from the Athearn example. In a conversation some years ago with Athearn's president and two production people, I asked about the deck tooling. Athearn has offered a their 50' Flat Car with a 40' Trailer in the current Ready-To-Roll line. This new release however lacks a deck for the trailer to rest in and only secures the piggyback on the hitch. In operation, the trailer's back tires tend to vibrate off the flat car. The appearance of the car and its operation would be greatly enhanced by the inclusion of this early '70s deck piece. None of the Athearn people I spoke with knew of the deck section in their collection of molds, but it did spark curiousity. Not long after Cox replaced Athearn items for its Far East imported line, Atlas used Athearn rolling stock to create train sets for the then-new group of Roco produced HO-scale engines. Atlas begins importing in 1975 a collection of EMD diesels made in Austria by Roco that were trend-setters in the marketplace. Scale-width hoods, flexible well detailed plastic handrails and plastic truckside frames with good depth and detail were all features of the mid '70s Atlas locos that set them apart from the competition. These bar-raising improvements could be considered inspiring factors in the improvements Athearn would introduce beginning in 1982 with its SD40-2. Atlas had a long history in the hobby prior to the 1975 introduction of the group of Roco-made diesels. Atlas was well known of its famous "snap track" and had a line of HO-scale structures. The company had no rolling stock and did not produce any during this period. Atlas offered train sets featuring their new diesels and their track and included Athearn rolling stock to finish out the package. As with the Cox pieces, generally the Atlas packaged Athearn rolling stock was standard pieces from the Athearn line fully assembled in an Atlas box. There are exceptions, Atlas appears to have omitted offering a caboose that matched the roadname of the diesel in their train sets. Atlas included Athearn's Standard Cupola Caboose model in train sets, but they were generic examples. I know of at least three variations: a Brown, Red, and a Yellow Caboose all exist in Atlas train sets of the '70s. The Brown and Red models feature only a four digit number in white on the car side; the Yellow example features a red number. Athearn did not catalog and is not known to have offered these three in kit form under their own name at the time, thus making them unique pieces to the Atlas collection of Athearn items. 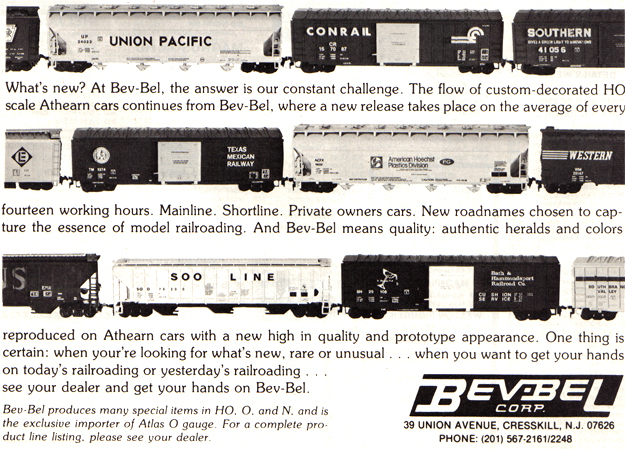 To the left is a Bev-Bel advertisement from 1982 featuring Athearn tooling with Bev-Bel decoration. Above is an April 1983 Con-Cor ad promoting an EMD SW-7 Switcher. The shell's tooling dates back to the mid '50s and the Revell line, while the drive for this Con-Cor release was an Athearn. The drive used for this run of Con-Cor SW-7's was Athearn's SW1500 (SW1200) drive. Above is an April 1983 Con-Cor ad promoting an EMD SW-7 Switcher. The shell's tooling dates back to the mid '50s and the Revell line, while the drive for this Con-Cor release was an Athearn. 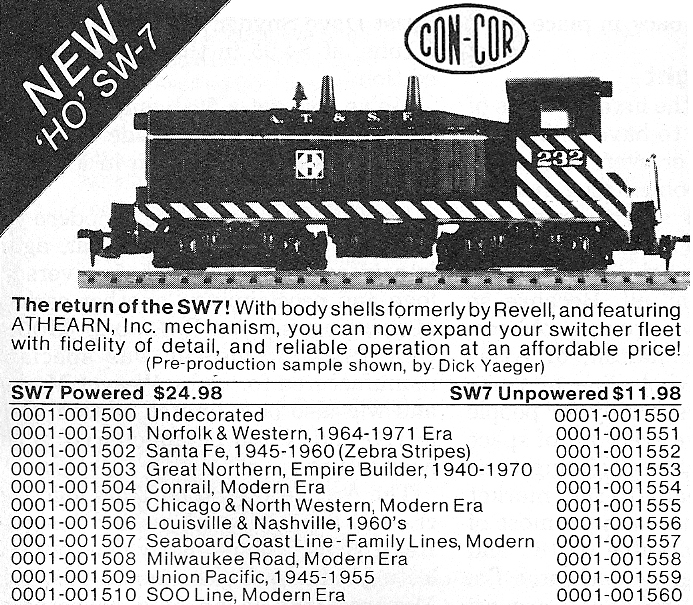 The drive used for this run of Con-Cor SW-7's was Athearn's SW1500 (SW1200) drive. You may click on the ad to see a larger version for better viewing.